The Cappelli House is a renovated and updated vintage home appointed with original mid-century modern furniture and decor. 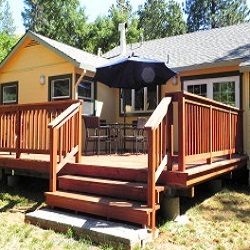 Freshly painted inside and out with refinished fir floors, porcelain and stone tile and new redwood deck. Located 2 blocks off Main Street, this three bedroom two bath home is ideally situated to enjoy all that Murphys has to offer: walk to restaurants, wine tasting, shopping and live music. This little town has been called the ‘Carmel of the Foothills’ and was named ‘One of the top 10 Coolest Small Towns in America’ by Frommers. Once the stomping-grounds of the likes of Mark Twain and Brett Harte, today Murphys is a well preserved and welcoming gold rush town with a laid-back atmosphere and modern amenities. Surrounding areas offer something for everyone. Winter sports fans will enjoy the world-class downhill and cross country skiing at Bear Valley, about an hour drive east on Highway 4 from Murphys. There are several outstanding public golf courses within easy driving distance that will challenge and delight golfing enthusiasts of all skill levels. The Stanislaus National Forest offers year-round recreation opportunities including hiking, backpacking, mountain biking, horseback riding, camping, picnicking, rock climbing, low speed boating, whitewater rafting and kayaking, stream and lake fishing, skiing, snowshoeing, snowmobiling and more, on over 250,000 acres of spectacular alpine terrain. Calaveras Big Trees State Park features two magnificent groves of giant sequoia, as well as over six thousand acres of pine forest, campgrounds, picnic areas, and miles of hiking and mountain biking trails. 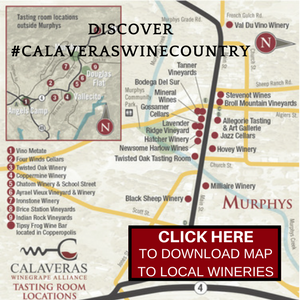 Calaveras County is also blessed with some spectacular caves and caverns, all of which are open to the public and offer a variety of tour options, including Mercer Caverns, Moaning Cavern and California Cavern. Nearby Lake New Melones provides boating, water and jet skiing opportunities. The more adventurous can try whitewater rafting on the Class IV North Fork Stanislaus River, or flatwater kayaking or canoeing on one of the many beautiful alpine lakes in the Stanislaus National Forest. For you cyclists, there’s no better way to enjoy a day in Murphys than on a bike.